Unfortunately, your registration has been declined by the auctioneer. You can contact the auctioneer on 0870 419 3340 for more information. You are the current highest bidder! To be sure to win, come back on 25 Feb 2018 19:02 GMT Date Format as the lot closes or increase your max bid. 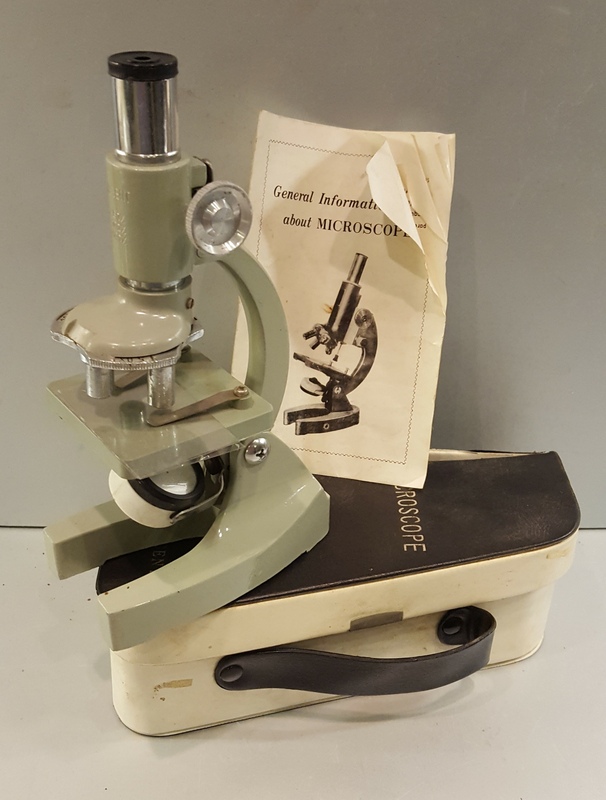 Vintage Retro Regent Scientific Microscope in Original Case NO RESERVE. Part of a recent Estate Clearance. Location of Items Stafford UK ST16. DELIVERY - The group clearing this stock will handle all deliveries using UKMail or MyHermes. Closing auction invoices do not include delivery unless stated within the lot description. --- SHIPPING FOR THIS ITEM: - Buyer Can Collect or Contact Vendor (Details on Auction Invoice) for UK shipping prices. Estates & Property Clearance, Staffordshire. Collectables, Antique Furniture, Vintage Watches. Please see the important information for each specific auction. All lots to be collected by 4 pm on Monday 5th March 2018. Items not collected by this deadline are at risk of being disposed of if the vendor wishes to do so. Most lots are stored on site in Stafford, Carver Business Park. If the goods are not stored at this specific location it will be made clear in the description where the lot/s are located. Collection will be by appointment only. Please note late payment fees and late collection fees will be added if applicable. Payment from outside of the UK will be subject to a £10 charge. Payment is to be made by Bank Transfer or cash can be paid into a Lloyds Bank, we do not accept card payment or cash on collection. No VAT on the hammer. These General Conditions of Sale (the ‘Conditions) apply to any auction held or organised by the Auctioneer. Seller: a person who has placed Goods with the Auctioneer for sale and who has the legal and beneficial title to the Goods listed in a Lot and/or any agent(s) authorised to act on their behalf. 1)2. Any person who attends an Auction and/or submits a Bid at an Auction held or organised by the Auctioneer, whether by electronic means or otherwise, is deemed to have read and accepted these Conditions by reference to their attendance at the Auction or submission of a Bid. 1)3. To the extent that these Conditions are inconsistent with any special conditions set out or referred to in the Auction catalogue or announced at the Auction, the special conditions shall prevail. 1)4. References to a ‘person’ in these Conditions shall (where the context requires) include a natural person, corporate or unincorporated body (whether or not having a separate legal personality) and that person’s successors and permitted assigns. (e) he will not contact any Buyers or potential buyers directly in relation to a sale of any Goods whilst they are listed in a Lot. (c) to instruct the Auctioneer to act in accordance with any special conditions. The Auctioneer’s remuneration shall be such as has been agreed between the Seller and the Auctioneer. The Auctioneer may (in his discretion) deduct his remuneration from monies received from the Buyer before accounting to the Seller for the balance. (c) the value of their Bid is at least equal to or greater than any minimum reserve price for the Lot set by the Seller (if any). 4.2 Upon satisfaction of the conditions in clause 4.1 a Buyer can only terminate a contract to purchase the Lot if the Goods comprising the Lot do not materially comply with the information provided in the Auction catalogue in relation to them. 4.3 Unless the Auctioneer has previously acknowledged in writing that the Bidder bids as agent on behalf of a named principal, every Bidder shall be taken to bid on his own behalf as principal. 4.4 Placing a Bid entitles the Auctioneer and any Seller to rely on the Bid as a genuine offer to purchase the Goods contained in the Lot. 4.5 If the Auctioneer has earlier acknowledged in writing that the Bidder bids as agent on behalf of a named principal, the Bidder warrants that he has the authority of his principal to make each Bid he makes. the Bidder must contact the Auctioneer at enquiries@wgandco.com The Bidder must give the Auctioneer a minimum of 24 hours notice to arrange a viewing of a Lot. Please note that the Auctioneer cannot guarantee any viewing of any Lot in the final 24hours of the Auction. email to - enquiries@wgandco.com Potential bidders must register for an auction to receive information about a lot. 5.1 The Auctioneer offers each Lot as an agent of the Seller and not as principal unless otherwise indicated in the Auction catalogue. 5.2 Any Lot may be subject to a minimum reserve price set by the Seller unless otherwise indicated in the Auction catalogue. 5.5 With the previous written consent of the Seller, the Auctioneer may sell any Lot by private sale before or after the Auction. 5.6 Any person wishing to place a Bid for a Lot at an Auction organised by the Auctioneer must register with Bidspotter.co.uk, their relevant details and register a valid credit or debit card before they will be able to Bid. 5.7 A Bidder who submits the highest value Bid for any Lot before an Auction is closed may be declared as the Buyer by the Auctioneer. 5.8 If a Bidder submits a Bid within 10 minutes or less of the closure of any Auction, the Auctioneer reserves the right to automatically extend the time during which Bids can be submitted for a Lot by ten (10) minutes. 5.9 The Auctioneer may decide whether there is a dispute between Bidders, summarily determine the dispute or immediately again offer the Lot for sale, in each case without being required to give a reason. 5.12 The Auctioneer reserves the right to reject any bids which the Auctioneer feels in its sole discretion does not reflect reasonable value. 5.13 The Auctioneer has a right to report suspicious activities to the relevant authorities, at any time. 5.14 The Auctioneer shall notify all successful Buyers by email. 5.17 The description of the item should hold precedence over the photographs. We reserve the right to use stock / catalogue images if original photographs cannot be used. Caution should be used when bidding on an item with only a stock image, as colours and sizes of an item can vary from the sale item. No warranty is given. 6.1 Upon the Auctioneer declaring the Auction for any Lot to be closed and the Lot to be sold, the Buyer shall immediately arrange to pay not less than 25% of the price offered in their Bid to the Auctioneer by way of direct payment into the nominated bank account of the Auctioneer (details of which shall be provided to the Buyer by the Auctioneer). 6.2 Payments shall be in pounds sterling (£) (unless otherwise indicated). 6.3 All prices are exclusive of VAT or other applicable taxes, delivery charges and insurance unless otherwise indicated by the Auctioneer (whether in the catalogue or otherwise). 6.4 Within  business day of the closure of the Auction in relation to any Lot the Buyer shall confirm the identity of any person on whose behalf he has purchased the Lot (if any). (b) where the final price for the Lot was not immediately determined upon the closure of the Auction for the Lot, the value as summarily determined by the Auctioneer, whose determination shall be final and binding, of all or part of any Lot. In every case time shall be of the essence. Deadline is 16:00hrs on the second day after the auction. 6.6 The Auctioneer may at any time in his sole discretion grant the Buyer an extension of time, in which case the Buyer shall pay the auctioneer in full in accordance with such extension before moving or removing the Lot. 6.7.4 pay interest on the overdue amount at the rate of 8% per annum above the Bank of England’s base rate from time to time. Such interest shall accrue on a daily basis from the due date until actual payment of the overdue amount, whether before or after judgment. The Buyer shall pay the interest together with the overdue amount. (d) if the Buyer effects or purports to effect a resale or any other disposition of all or part of the Lot, the Buyer shall hold the proceeds of resale or other disposition on trust for the Auctioneer and the Seller. 6.9 On written request by the Highest Bidder the Auctioneer shall provide a VAT invoice in a proper form, if appropriate. 7.1 The Buyer may not remove their Lot until after the end of the Auction and the Auctioneer has confirmed that they are holding cleared funds received from the Buyer without the prior written consent of the Auctioneer. 7.2 After paying the sums specified in clause 6.5 above, the Buyer must remove the Lot bought within 5 days of the end of the auction. In each case time shall be of the essence. 7.3 The Auctioneer may at any time at his sole discretion and on terms reasonably specified by him grant the Buyer an extension to the time specified in clause 7.2 above. 7.4 If the Lot bought is or includes a motor vehicle, no warranty is given by the Auctioneer that the vehicle may safely or lawfully be driven on any road. (a) is responsible for detaching any Lot fixed to land and must do so safely and lawfully and must not use flame cutters, explosives or any other dangerous equipment or process without previous written permission signed by or on behalf of the Auctioneer; a written Health and Safety plan with method statement may be required. (d) shall have adequate insurance in respect of such indemnity and shall on request produce to the Auctioneer a receipt for the last premium due or other sufficient evidence that such insurance has been effected and remains in force. 7.6 The Auctioneer reserves the right to stop the removal of any Lot if in their sole discretion they do not believe the Lot is being moved in accordance with clause 7.5 above. 7.6 It is the Buyers sole responsibility to arrange for collection or delivery of the Lot. 7.7 Lots will not be released, even when purchased, if there is an outstanding invoice, in this or another auction. 7.8 Purchasers should contact the vendor or agent, once an invoice has been paid to ensure there are no lifting out fees for large, outsized or dangerous goods. 7.9 There is no guarantee of collection in the first 48 hours after an auction. 7.10 Once an item is removed from the sellers location by the buyer or a third party on their behalf, then it is deemed to be acceptable and correct. 7.11 Any issues relating to an item should be taken up with the vendor at the point of collection. 8.1 Goods sold in any Lot are sold as seen, with all faults and imperfections and the Auctioneer is not responsible for any defects whatsoever (whether latent or not). 8.2 No warranty or representation of any kind is given or authorised to be given by the Auctioneer with regards to any Lot. 8.3 The Auctioneer has no liability to the Buyer for any delivery or collection costs. If the Buyer is unable to collect any Lot, the Buyer is to contact the Seller, once the invoice has been paid. 8.4 The auctioneer is acting as the sales agent for the lots in auction. Any problems with a lot should be taken up with the vendor. (d) details from their bank confirming method of payment. (e) the Buyer has read and agreed with these Conditions. 9.4 If there are any special arrangements that the Buyer wishes to make with the Auctioneer, the Buyer must contact the Auctioneer at least three business days before an Auction takes place. 9.5 We reserve the right to insist a deposit is paid before bidding from an overseas bidder. 10) VAT and subsequent refunds. 10.1 All Buyers intending to export a Lot will be charged an additional deposit equal to that of the VAT due on each Lot purchased. 10.2 In order to qualify for a refund, the Goods must be exported in accordance with relevant export regulations and valid written evidence of such compliance shall be sent by the Buyer to the Auctioneer within one month of the date of export to the following address on official company headed notepaper signed by the Buyer: William George & Co Ltd, 8 Phorpres Close, Peterborough, PE7 8FZ. 10.3 Where satisfactory evidence is not provided, goods will be subject to UK VAT at the standard rate of export and the Buyer will forfeit any deposit they may have paid in accordance with this clause 10. 10.4 The Auctioneer is unable to refund the VAT on the Buyers’ Premium in any circumstances. 10.5 If the Buyer chooses to export their purchases using their own transport, then VAT will be levied and refunded upon satisfactory documentation supporting the removal of the Goods purchased being sent to the address set out in clause 10.2. (b) to sell any Lot (in whole or in part) to a Buyer. 11.1 If at any time the Buyer fails to pay any of the sums under these Conditions when they fall due or to remove any Lot by the time specified in clause 7 above (or any extension granted under clause 7 above) the Auctioneer may rescind the sale of that Lot, in which case any deposit shall be forfeited, and that Lot may be resold by Auction or privately by the Auctioneer. 11.2 If the Auctioneer has rescinded the sale but the Buyer has removed the Lot bought, the Auctioneer shall be entitled upon serving reasonable advanced written notice on the Buyer, to enter upon any premises where he believes the Lot to be and safely remove it. (b) the costs of and costs incidental to the resale of the Lot. 11.4 If the Buyer has failed to remove any Lot by the time specified in clause 7 above (or any extension granted under clause 7 above) and as a result the Seller is unable to give vacant possession on disposing of or relinquishing any interest in the premises from which the Lot should have been removed, the Buyer shall compensate the Seller for any loss arising from their failure to give vacant possession. 11.5 If at any time the Buyer in any way breaches or defaults under any of these Conditions, the Auctioneer reserves the right (without prejudice to any other rights) to issue proceedings 28 days after the Buyer’s initial default or breach of these terms. The Auctioneer’s claim shall include, but not limited to, any loss of earnings (buyers commission), any administration charges, any storage charges and any legal fees associated with the Buyer’s breach or default (all amounts will exclude VAT). 11.6 The Auctioneer reserves the right to recover any outstanding charges from the Buyers payment card used to register for the Auction. 11.6.1 if the card used to register is fraudulent, registered to a third party or does not have enough funds on it to cover the cost, a £25 plus Vat fee will be added to the invoice. 11.6.2 if we have to take payment from a registered card, we will endeavour to take from the invoice, in descending order, the whole amount, half the amount, one quarter of the amount, our premium plus Vat, £100 and then £50. (a) Administrative charge of £250 plus VAT to defend the charge back. (b) Storage charges will start immediately the Charge Back notification is received from our bank for a minimum of 28 days at a rate of £50 per item per day, plus Vat. We will also look to recover all of our premium. (c) All Chargebacks will be pursued through the courts. 11.6.6 Invoices that are outstanding 10 days after the end of the Auction will have the funds debited direct from registered bank card. This will include but not limited to the Buyer’s Premium, storage and transport costs and Vat. 11.7.3 any court fees that are incurred, including but not limited to £90 lost wages, travel costs and £165 hearing fee. 11.7.4 Our solicitors rate for attending court is £300 plus VAT per hour, plus expenses. 11.7.5 Our staff rate for processing a legal claim is £70 plus VAT per hour plus expenses. 11.8 Any Buyer who is in default or breach under these terms shall be banned from any Auction held by the Auctioneer, Bidspotter or ibidder. 12.1 The Auctioneer will only use the personal information provided to them to provide auction services, or to inform Buyers and Sellers about similar services which they provide, [unless told by such parties that they do not want to receive this information by ticking the ‘opt out’ box on the bid slip, or by ticking the relevant box on the relevant web page. 12.2 The Buyers and Sellers acknowledge and agree that the Auctioneer may pass their details to credit reference agencies. 13.1 No failure or delay by the Auctioneer to exercise any right or remedy provided under this agreement or by law shall constitute a waiver of that or any other right or remedy, nor shall it prevent or restrict the further exercise of that or any other right or remedy. No single or partial exercise of such right or remedy by the Auctioneer shall prevent or restrict the further exercise of that or any other right or remedy. (b) if the Auction is held in Northern Ireland, in accordance with the laws in Northern Ireland (where applicable). 15.1 The Auctioneer reserves the right to decline a bidders registration to bid without notice or recourse. 15.2 The Auctioneer reserves the right to request a deposit from all or any bidders at any time. 15.3 Unless and Invoice is amended within 1 business day as per point 6.4, to state that the name should be changed to a Company. Then the registered bidder is always liable for any outstanding invoice. 15.4 If the invoice is changed to a company as per point 6.4 and the company goes into liquidation or is dissolved then the original registered bidder will still be liable for any outstanding debt. 15.5 We reserve the right to request to Companies House that any company that has an outstanding debt is halted from dissolution until the debt is cleared. 15.6 A bidder must give their full name at registration, initials and nicknames are not valid. 15.7 By registering for an auction, you agree to be entered into our mailing list. 15.8 If you are purchasing an item through third party finance, this needs to be pre-arranged so that there is no delay in payment. 16.1 All our telephone calls are recorded. We reserve the right to use them as evidence in the event of a dispute. 16.2 All auctions are Business to Business transaction and not a retail transaction. 16.3 The contract of sale is between the Vendor and the purchaser, William George & Co Ltd, its staff and subsidiaries are the broker to ease the transaction and is not liable whatsoever.